Howdy! 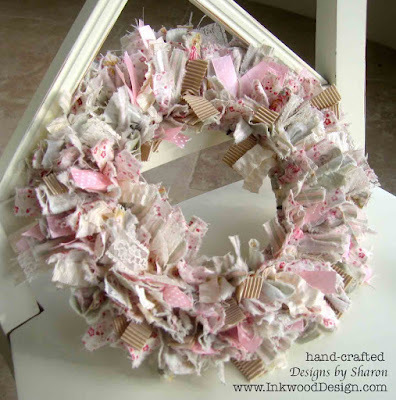 I made a wreath from fabric strips, and a few ribbon pieces. I was so happy with the final result, that I want to share with you all, on how I did it. Now, if you search the internet, you will find a lot, (and I do mean ALOT of tutorials). I used european size fat quarters, and had some fabric left over. The ribbons I used, were neutrals, and one pink. I also used some lace trim. The wire wreath I used is an eight inch round. The pattern on this stripe fabric is simple, so I tore 1/2" strips, and then cut the strips into quarters. This pattern is a bit more busier, so I tore 3/4" strips, and then cut the strips into quarters. The largest pattern, I tore 1" strips, and then cut the strips into quarters. I measured out a foot, from each fabric, then made little snips with my scissors, and then tore the strips. I cut each strip into quarters, so that each scrap measures approximately 5" long. I cut a variety of ribbons and trims into 5" lengths. I also cut several strips of pink satin ribbon with white polka dots. Once I finished looping the fabric strips around the wires, I went through to ensure that each wire segment had the same fullness. So, there was some adding, and a few changing of ribbons and fabrics. Wow! I love the wreath, it's beautiful. Since I don't sew this is a perfect project for me. Thanks for the great instructions I am going to give it a try! Love love love it!! I have so many fat qtr pieces...I am going to have to make one of these for my door for summer! TFS! !